Where on single-strand there is no symmetry when read (3'---> 5') and (5' ---> 3'). BUT I'm not telling like that. i'm telling about a situation where a reflection-symmetry present in each single strand when read (3'---> 5') or (5' ---> 3'). From no angle it is a palindromic-sequence because the symmetry is not between 2 opposite strand. So I thought, if really there exist any sequence literally like "AND MADAM DNA"... whatever if there is any terminology for it or not. 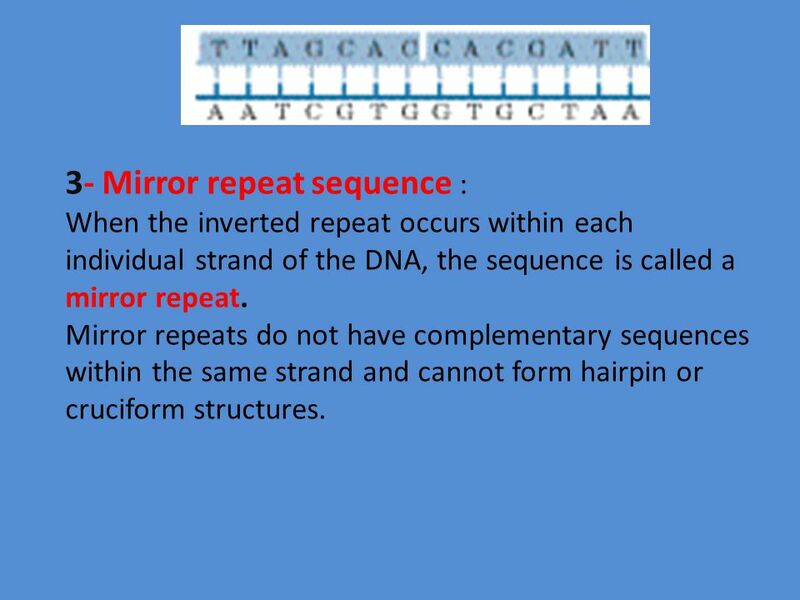 One other Q/A site mentions about a term "mirror repeat", with exact same situation as OP, but gave no reference and further biological importance. Latest revision of Wikipedia also mentions a term mirror repeat and everted repeat, but no further explanation and hyperlink is given. Another result from google search. It's simply called a palindromic sequence. 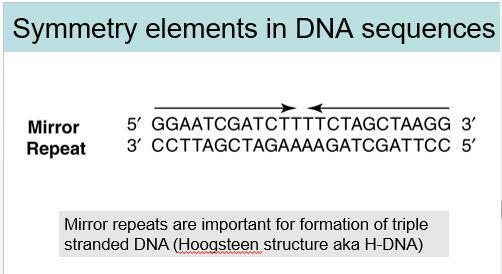 As you can see here, these sequences are called inverted repeats when random nucleotides are found between the initial sequence and its reverse complement (e.g. TTACGnnnnnnCGTAA), while when there are no nucleotides between them they're called palindromes. Sorry for my previous answer, I must've missed the point. I think the situation you showed should be called mirror-everted repeats: to my knowledge, it's a very rare occurring, and I only found some reference in this and this articles, even though no graphic explanation is provided. P.S. Should you not be able to access the full text of the second article, just let me know. As an example of biological symmetry, with my tongue in my cheek, I would call this a mirage. does not have mirror-image symmetry. This lack of symmetry is because of the asymmetric nature of the phosphodiester bond. The 5' and 3' in your diagram clearly illustrate this fact (3' is not the reflection of 5' either typographically or structurally) If you don’t follow this, draw out each phosphodiester bond in the sequence halves. The base order in the second half may mirror that in the first half, but the directionality of the phosphodiester bonds is the same. This is not just pedantry but explains why (or is consistent with) such structures appear to have no importance in biology and hence no name. (One only gives names to things one needs to refer to.) One would not expect such structures to occur frequently as they can not be generated by duplication (inverted or not). Those that do occur by chance lack symmetry and would be no more likely to bind proteins than any other sequence (symmetrical DNA structures apparently lending themselves to protein-recognition). I imagine one could describe such structures in a mathematical sense and give them a name, but if that is your question it should be migrated to a different SE. Not the answer you're looking for? 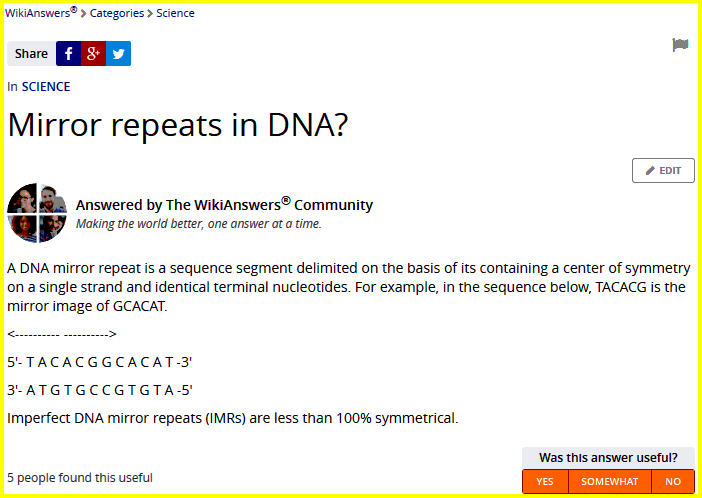 Browse other questions tagged bioinformatics terminology nucleic-acids repeatitive-sequence or ask your own question.